Orca Young Solid Black Trained German Shepherd for sale - ZAUBERBERG! 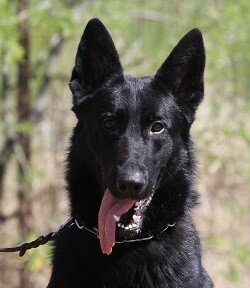 Orca is a beautiful athletically built German Shepherd male. A young natural athlete. Orca was raised by one of our trainers in Scottsdale. Although, he has an natural time-to-relax mode, he would best be excellently suited “having a job to do” or “dog sport.”. Obedience conditioned primarily for an IPO or protection handler Orca has shown us all the signs of being a great dog to live an energetic life. Intensity in work, aloof, and eager to learn means to us that he should be the primary focus of the new owner. At his age, with your hand he could be the dog of your dreams. Although not a requirement for purchase, we recommend a handler course in Tucson with our Master Trainer, Andreas Mueller upon delivery. Interested in Orca vom Zauberberg? Conditioned for down, sit, stand, recall, potty command, performance and excellent attentive heeling. © 2019 ZAUBERBERG! - All Rights Reserved.